I must warn all of you now. This review is probably going to be long and it's going to be fangirling. My goal is to make you want to read this book now because trust me, you do. I've been a Leigh Bardugo fangirl since [a lady never reveals her age] and she's become an insta-buy author. There's just something about her books that make you feel like you're part of the story. I can't describe it - there isn't really an exact formula. It's a mix of everything, really. Yeah, that's called talent. I wasn't sure about this book at first because there isn't much of a plot on the back cover. We don't really know what it's about. I was unsure of that but I'm actually so glad I went in blind because the actual plot is so epic and I love how creative Leigh combined science with The Grisha, even though most of the characters weren't Grisha. There are six different main characters. However, unlike other books I've read, Leigh seamlessly bounces between the characters and even more spectacular, she's able to make us feel connected to them. I don't even like 3rd person perspective most of the time but I loved this book to pieces. Only hours after just finishing it, the only thing I want to do is read it again. I would love to tell you about every character in detail but that would take forever. All you need to know is that I loved all of them because they were so different. Like one was almost nerdy, which is making me giggle. My favorite character has to be Nina though. She's so sassy and fun. And she's brave. Brave to the point where I want to put the book down and process her strength of character. Plus, her and Matthias reminded me of M'gann and Connor from Young Justice if you're into that. My fangirl heart, be still. The ships have sailed in this book. Metaphorically and literally. Even though there was so much action and the stakes were so high, I couldn't help but love the bits of romance that were pulled into it. There were a two ships and I loved them both for different reasons. One was more prominent than the other but for some reason, I liked the less prominent one more because of the possiblities for some epic romance in the sequel to this book. THE SEQUEL COMES OUT IN A YEAR. WHAT DO I DO? Leigh Bardugo is the New York Times and USA Today bestselling author of the Grisha Trilogy: Shadow and Bone, Siege and Storm, and Ruin and Rising. She was born in Jerusalem, grew up in Los Angeles, and graduated from Yale University, and has worked in advertising, journalism, and most recently, makeup and special effects. These days, she’s lives and writes in Hollywood where she can occasionally be heard singing with her band. Her new book, Six of Crows, arrives fall 2015. Everybody is loving this! I want to read it!!!! AND THE COVER!!! Ugh I love it too much! AHHHH I'M SO EXCITED FOR THIS BOOK. Leigh Bardugo is amazing, clearly. Although I still haven't read Ruin and Rising...must get on to that! I actually didn't like Shadow and Bone much (please don't kill me) but Six of Crows sounds very interesting! The characters all feel very three-dimensional and their description in the synopsis sounds fascinating. SO SO SO SO excited for this one! And I keep coming across glowing reviews like this one, which is making me even MORE excited. I bought this today, and I nearly had a heart attack when I saw it sitting on the shelf (I didn't think it was out yet!?) but oh my gosh, am I excited to start. AHHHHH I'VE BEEN WANTING THIS BOOK FOREVER (or so it seems!) I'm still in the process of reading the Grisha trilogy (in the process of reading book one), but I am absolutely loving it so far and based on the fantastic reviews of Six of Crows (and the amazingness of the sample of it that I was able to read), I want it in my life. Fantastic review, Nova!!! Everyone keeps mentioning how awesome the "romance" is in this book so I'm hella curious! My copy is supposed to arrive tomorrow! Everyone loves this book, and I'm sitting here like: CHIARA, WHY HAVEN'T YOU READ THIS YET? I mean, I freaking love the Grisha trilogy (Shadow and Bone is one of my top nine favourite books EVER), and this is a companion series about thieves, and has an m/m romance, and a beautiful cover and ?????? I need to by this book. I need to by the beautiful hardback with the gorgeous black pages because IT IS SO DARN PRETTY. 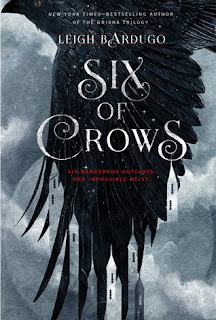 I seriously love the sound of everything you mentioned here, and I really just need Six of Crows in my life right now (even though waiting will be torturous).